16oz can purchased for $2.59 at Main Market Co-Op in Spokane. No obvious freshness date on the can. Poured a clear, slightly dark golden color, with a big, sudsy bone-white head that dropped away within a couple of minutes. Looks a lot like a macro-lager. A little bit spicy in the nose. This spiciness is all that stands out, otherwise it would just smell like an averaged mass-consumption lager. Mild spicy notes and a grassy hop flavor greet the taste buds. There’s a real subtle, dry fruit flavor in the background. After that, it’s a quiet, unremarkable fadeout. Medium bodied, with a slightly prickly mouthfeel. A fairly plain example of a Saison. Once again I find a beer from Hilliard to be pretty unremarkable. I won’t need to try it again. Pour - straw-colored pour that is soft and slightly cloudy. A nicely formed inch of foam on top. As it settles a bit it clarifies a little. Aroma - yeasty spiciness, coriander, sour wheat, grainy, lemons, pears and honey. Very aromatic. Taste - light on the palate but plenty flavorful. Sweet with hints of pears and green apples along with some grassiness and plenty of spiciness from the yeast strain. Some hints of bitter lemon and light wheat. Clean and crisp, this goes down extremely well (and perhaps a bit too fast!). Carbonation is spot on and it has tartness that combines very well with the tangy, yeasty finish. Overall - love this beer. A very well brewed Saison with the great yeasty spiciness that defines the style. Crisp and refreshing - an excellent brew anytime of year. I love that they chose to can a Saison early on and can't wait to see what they choose to can down the road. I also love the retro-esque look of Hilliard's can designs. 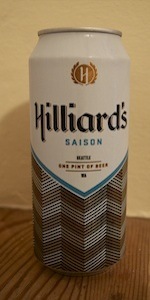 I first tried Hilliard's out on a Road Dawgs tour of Seattle breweries, even though I am a resident and not tourist. I recall liking the pils but nothing else. I've not had any since (two years) because Hilliard's tends to be expensive and there's just too much good PNW! But, deciding to treat myself to one of my favorite styles, I bought a four pint pack. Why, why? The nose was AWOL. The appearance: poured into a glass it's nearly as pale as a run of the mill lager. As for taste: I get it when the brewers state that this beer is made in the old way, without addition of spices but as far as I'm concerned, all the more pity for it. This beer's body and mouthfeel thin; great carbonation, and little body and nearly imperceptible aftertaste. If anything, it has the beginnings of what wants to be a saison but ends up metallic and tinny. There's no bitterness, but no smoothness, nothing substantial enough that I can bring an adjective to. A wastes of $ and caloiries. I'm torn between the macro looking liquid and the amazing head. The beer itself looks like something you get from a case of 30 for $13.99. It's straw yellow and mostly clear. The only thing that prevents it from being Bud's brother is a bit of chill haze. The head, however, is many fingers thick. Bright white bubbles create a multi-layered head of different sizes and textures. Thick sticky lace. Hard to tell it's a saison from the smell, but it distinguishes itself from also ranks with a crisp cereal grain nose with a bit if citrusy lemon. Smells like a cracker with a slice of lemon on top. This seems to have some pale malts and a bit of Pilsner malt as well. Fortunately, the lemony citrus bits counter the crappy malt bill generating something that's drinkable. There isn't as much funkiness as I would have guessed from a saison and there isn't much tartness either. The acidy lemony citrus makes this beer what it is. There is some bitterness but the acid cuts right through it. Fairly effervescent and crisp finish to scrape the palate clean. As much as I dislike Pilsner malts, this beer mostly works. The yeast is the star here. Pours a transparent straw-like yellow color with a decent foamy head. Smells of light wheat with hints of lemon citrus and a small hint of pepper or clove. Taste is biting yet fruity. There is a dry peppery taste accompanied by citrus--mainly lemon--flavor and the sweet taste of Belgian sugar and yeast. The beer is light bodied and pretty bubbly in the mouth. There is a bit of hop presence as well. Overall this is a pretty drinkable beer that represents the style pretty well. There is quite a bit going on here but nothing too overwhelming. A nice beer. taste: The concept of having a local (~0.5 miles from my house) canned saison is extremely useful. Not only is it portable, the saison is in my opinion the most functional and versatile beer on the planet. The hilliards version is quite light on the funk compared to belgian counterparts but has a pulpy delicious freshness to it - tangerine, lemon zest, peach, pear, crisp yeast, light spice. One from a 4-pack of 16 oz. cans, picked up earlier this week at Whole Foods-Westlake in Seattle. Cracked and glugged to an imperial pint glass. A: A milky/cloudy version of 'blonde'; a paler yellow with abundant carbonation. Really hazy, in fact. A fluffed white topping (a finger, maybe?) that dies rather abruptly. Broken skim of cream on top and some good lace. All told, it's a nice-looking saison. S: A sweeter, honey-drenched kind of saison. Bready, fruity (apples primarily), a sprig of herbal greenness. A twinge that's not quite 'sour', but that definitely falls into the nebulous 'funky' category. Really nice strength - it grows better and better as it warms. T: Solid 'farmhouse' ale: loads of baked bread (with a peppery-dry backbone and minty 'menthol' quality as well). Peppery and very dry spicing, a chalky 'mineral' quality, too. Bitter in the end, almost to a fault. M: Light-medium body, good effervescence/carbonation. A slighlty coating malt/grain effect. Finishes bone dry and quite crisp. O: I haven't tried too many canned Saisons, so comparisons are lacking. This is NOT better than Surly's canned version of the style, but it's still plenty tasty AND not far behind. Worth having again and certainly worth snagging a 4-pack if you're in Hilliard's extremely limited distribution area. Appearance is golden yellow with a crisp head that dissipates to a light film, nil lace. Smell has an earthy spiciness in the yeast, lightly fruity having a malt aroma in the background. Taste has a richness in the fruit and spice with a bit of tart coming out and having a good malt backbone that comes out and a bit dry in the end. Mouthfeel is heavier than a light with a good spike of carbonation. This Saison gives us enough complexity to be true to the style. A: Crazy super light yellow....pretty lol. Lots and lots and lots of little bubbles. Thin whispy head. Lots of bubbles. S: Funkylicious! Leather, an old couch. Musty and musky. Slight lemon/pineapple. Man I love this smell. T: Again, funkylicious! Yummy funky too. M: Tingy. Thin and whispy. Love it!!! O: I couldn't drink these all day, but man this was one enjoyable brew!!!! A- Nice pale yellow color. Real light foamy head. S- Smells like a BMC type beer mixed with a German Hefe. T- The taste is interesting. It is similar to the smell. BMC with a German Hefe mixed in for flavor. Clove and banana esters are the driving flavors for me here. Savory comes to mind for me. M- Very light and carbonated, almost too carbonated for me. O- Not too bad, would be a great summer hot day beer. A good combo for a hot day . Poured into straight pint glass. Poured a nice hazy yellow color and ended up with about a half-inch of white head that hod very low retention and no lacing. There was a nice grain base to the scent, with a good yeasty spiciness on top. It had the aroma that typifies the style. On the on tongue, the flavors were crisp. Again, a solid grain base upon which the yeast and spices flavors floated very well. The body was just a touch thinner than I like in the style, but was good and coated the tongue well. Drinkability was very good, as I find Saisons to be in general, the beer was smooth and clean and left just a tingle of spice. Overall, a pretty good start for this new brewery. Worth having when you see it, and probably worth getting in a trade. Frothy snow white head that fades but trails over a cloudy dirty blonde body. Big funky barnyard nose with some lemon zest. White bread base, big blast of white vinegar, some earth, a bit of white pepper, and an herbal tang to end. Funky finish and limoncello linger. Funky base is bigger than a lot of other so-called saisons, but citrus-forward, so ends up refreshing. However, a bit too full and strong to kick back with like you wanna do with a can. Keeps it real, though, even if it is funk and lemon and not much else. Thanks to 5000 for sending this can my way. The beer pours a yellow color with a white head. The aroma is full of wheat and biscuit malt, with some Belgian yeast and white pepper notes thrown in. The flavor is a little more complex. I get some nice orange citrus notes, as well as some wheat, Belgian yeast, white pepper and biscuit malt. Medium mouthfeel and medium carbonation. T: Big yeast presence on this initially. Some citrus and banana really take over balanced with a sordove sulfur meets spiciness. The finish has a lingering yeast, fruit presence with dying spices, sordove cloying. O: Not a bad beer. However, compared to other traditional farmhouse beers like Logdsons I find it very hard to rate it any higher than average. Tall boy in awesome retro can. A- Poured cloudy orange with a nice white head. S- Big barnyard funk with orange peel and lemon zest. M- Tart, refreshing and highly quaffable. O- Not a lot of experience with this style other then Saison Dupont. I really enjoyed this beer as it portrayed lots of interesting flavors and can imagine this being really refreshing on a warm summer day. Great job. Smells of must and bananas, some spices. There's something vaguely mushroomy about it. Taste is nice spicy fruity saisony-ness, banana, clove, some other bright stuff in there, some sourness. It's actually pretty darn good! Significantly better tasting than it smells. Mouthfeel is light and airy. Overall, I'm impressed.